As a proud Jungle Asian, I have a very serious soft spot for my brethren bred in the tropicalia of Southeast Asia. So please join me in delighting at the summery, salty sounds of White Shoes & the Couples Company: a chic little sextet from Indonesia that makes the soft, lingering beats of bossa nova and samba seem fresh, and vintage beachy looks oh-so-au courant. They’ll be crossing the pond to the west to join us for SXSW this year… we just hope they’re willing to party (dancing gently to island tunes) with us in Austin! 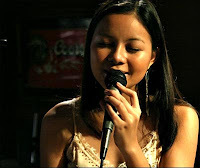 Happy 22nd Birthday, Filipina bossa nova ingenue Sitti Navarro! May your voice remain as smooth as your skin, and your life as calm as your albums’ sweet and silky beats.